Manipal and Renuka Reddy both have very fond memories of growing up in Hyderabad, India. As is quite common in India, Renuka is part of a very large, extended family, and is extremely family-oriented. Manipal grew up in a smaller family, one of four brothers, and is also very committed to his family. 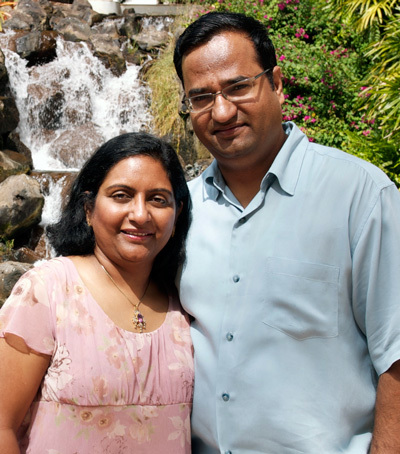 Both engineers by profession, and equally ambitious, Manipal and Renuka had come to the United States in 1985 to pursue master’s degrees in computer science at the New Jersey Institute of Technology. By 1989, they were both developing successful careers in the telecommunications industry when a friend offered them an opportunity to open their own business. It awakened their entrepreneurial spirit, and Manipal, a go-getter from the word GO, saw the potential and took charge. He grew the business himself until late 1990, when Renuka joined him to actively build the business together. Today, Manipal and Renuka believe all the hard work paid off – in a big way. Their business has given them the chance to schedule their time so that family comes first. They have been able to be home in Neshanic Station, New Jersey, with their sons, Kedar and Keshav, while still remaining active in their business. And they are secure in the knowledge that their business is poised to take them to even higher success. By giving up travel while they were building their business, Manipal and Renuka and their sons now travel regularly to Hawaii, the Caribbean and back to India. As the Manipal and Renuka have achieved success in their business, they also give their time and energy to support worthwhile charities. They are especially active supporting Easter Seals New York and the U.S. Dream Academy due to the programs these organizations have developed to meet the needs of children and returning veterans. Manipal and Renuka originally felt that their best chance to succeed was to get great jobs and secure good incomes. But they found quickly that their success came at too great a price: they had no time, and no security. Building their own business gave them their time back, gave them their family back and most importantly gave them choices in life that they would never otherwise have.